By Sabrina Valle and Kevin Crowley (Bloomberg) — In a single year, Exxon Mobil Corp. has gone from being a tiny bit player in Brazil to the second-largest holder of oil exploration acreage, trailing only state-controlled Petroleo Brasileiro SA. The last 24 concessions the U.S. giant bought with its partners may hold 41 billion barrels, based on preliminary studies, according to Eliane Petersohn, a superintendent at Brazil’s National Petroleum Agency, or ANP. While the existence of the oil still needs to be confirmed, along with whether its extraction will be cost-effective, it’s a huge figure — almost double Exxon’s current reserves. “When you do the cumulative effect of all of those multibillion-barrel targets, then you come up with quite a material resource out there that has the capability to produce at very large volumes,” Stephen Greenlee, Exxon’s president of exploration, said in an interview in Houston on Wednesday. The world’s largest publicly traded oil producer is betting Brazil will be at least part of the solution to its long-term challenges. Exxon’s stock has underperformed its Big Oil rivals over the past five years due poor returns on historic investments, and production has declined year over year in eight of the past nine quarters. Exxon’s meteoric rise in Brazil started in 2016 after the impeachment of then-president Dilma Rousseff. Under her left-wing government, the company held just two idle blocks in Brazil. Rousseff’s ouster ushered in policy changes, a shift that deepened after her Workers’ Party lost ground in Congress, and as the next president, Michel Temer, scrapped nationalistic laws and auctioned off exploration rights. Exxon overtook Royal Dutch Shell Plc, Total SA and Equinor ASA in exploration acreage in a matter of months during the record offering of new blocks. The friendly environment for Big Oil is expected to continue if far-right congressman Jair Bolsonaro is elected president, an outcome that looks more likely after his surprisingly strong showing in the first round of polling on Oct. 7. His selection would reduce any risks of a policy reversal, according to most observers, even though the candidate hasn’t spelled out his economic policies in detail. The Irving, Texas-based company is betting big in particular on Brazil’s offshore, where a single block is currently producing more than all of Colombia and profitability compares to the best U.S. tight oil, according to Decio Oddone, the head of ANP. Brazil has surpassed Mexico and Venezuela to become Latin America’s biggest producer and has been a major source of non-OPEC production growth in recent years. Daily output is currently 2.5 million barrels per day, and Oddone estimates that will rise to 5.5 million by 2027. At the same time, spending constraints have prompted Petrobras to forgo its dominance in the so-called pre-salt, the oil deposits trapped under a thick layer of salt deep in the Atlantic seabed. The pre-salt has become too big for a single company to produce, Oddone said. That offers well-funded majors like Exxon an opportunity. Before the recent investments, “pre-salt Brazil was probably the biggest gap in Exxon’s portfolio,” Ellacott said. With its mammoth resources, the South American country offers some relief for the company, albeit over the long-term. Of Exxon’s five major projects over the next decade, Brazil probably has the longest ramp-up to peak production, but it also offers the most potential, according to Ellacott. Greenlee cautioned that most of Exxon’s Brazilian area has “yet to be discovered” and exploration carries “significant risk.” Given the amount of drilling that still needs to be done, the first oil from its concessions isn’t expected until the late 2020s, he said. 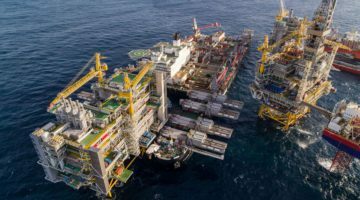 The first exploration wells will be drilled in blocks operated by Petrobras next year and Exxon will add some wells from 2020 once its environmental permits are approved, he said. It should take six to eight years for oil to start flowing if economically viable deposits are discovered, according to ANP. While the oil majors race to secure pre-salt stakes, Petrobras’s share of Brazilian oil output has been steadily falling — it was 72 percent in August, versus 93 percent in 2010. Petrobras has sold off areas already in production to help lower its debt load. “Brazil has the capacity and geological potential to have three or four Petrobras operating,” Petersohn said.